Have you ever noticed a stomach bug spreads like wildfire through your office? Maybe your car pool shares driving duties and a miserable cold several times a year. Imagine being able to avoid those bouts with illness and bothersome sniffles and sneezes. In Dr. Michael Berry’s book titled Protecting the Built Environment: Cleaning for Health, he talks about a concept called “cleaning for health”. Dr. Berry encourages commercial cleaning systems that tackle health hazards as well as eliminate dust bunnies and sticky spills at the coffee bar. It might surprise you to know that the CDC estimates 325,000 people are hospitalized and 5000 people die each year from foodborne diseases. So what does all of this have to do with color coding mops and brooms? Color coding cleaning tools is an active way to clean for health. Experts like Dr. Berry know that cross-contamination is one of the primary channels that allow bacteria and microbial organisms to spread through an office or daycare—or that carpool van. Humans are perfect cross-contamination vehicles. Touch the knob on the way out of your home and you will transfer germs to the latch on your auto. Cleaning supplies like rags, brooms, and mops do the same thing. By designating unique colors to each area, cleaning crews have more control over where germs migrate. Cleansing agents are designed to tackle specific soils. Producing a sterile aluminum sink requires a different cleanser than one to produce streak-free windows. To take it one step further, the bacteria that thrive in restrooms are not the same you would expect to find in the boardroom. If you use the same mop in the boardroom as the restroom, you are potentially carrying harmful bacteria to another work area. 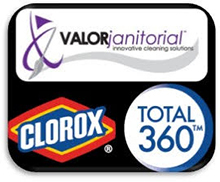 By using washable color coded mop heads, rags and brooms in designated areas, cross-contamination is remarkably reduced. Individual companies can establish their own color system to fit their needs. Using washable rags reduces contributions to the landfill and could actually save money on the cleaning budget. Employee education and management support make the conversion process easier for employees and cleaning crews. Think back to those 325,000 people that are hospitalized with foodborne disease. If your company is still using the same rags to clean a food service area and office areas, you may be unknowingly contributing to the spread of those illnesses.